بیرونی, رضوان, میرزایی, معصومه. (1395). جذب سطحی سولفات بر روی نانوذرات آهن بر بستر اکسید گرافن و کربن فعال. مجله آب و فاضلاب, 27(6), 24-32. رضوان بیرونی; معصومه میرزایی. "جذب سطحی سولفات بر روی نانوذرات آهن بر بستر اکسید گرافن و کربن فعال". مجله آب و فاضلاب, 27, 6, 1395, 24-32. بیرونی, رضوان, میرزایی, معصومه. (1395). 'جذب سطحی سولفات بر روی نانوذرات آهن بر بستر اکسید گرافن و کربن فعال', مجله آب و فاضلاب, 27(6), pp. 24-32. بیرونی, رضوان, میرزایی, معصومه. جذب سطحی سولفات بر روی نانوذرات آهن بر بستر اکسید گرافن و کربن فعال. مجله آب و فاضلاب, 1395; 27(6): 24-32. این مطالعه با هدف بررسی آزمایشگاهی حذف یون سولفات با استفاده از کامپوزیت نانوذرات آهن بر بستر اکسیدگرافن و کامپوزیت نانوذرات آهن بر بستر کربن فعال انجام شد. 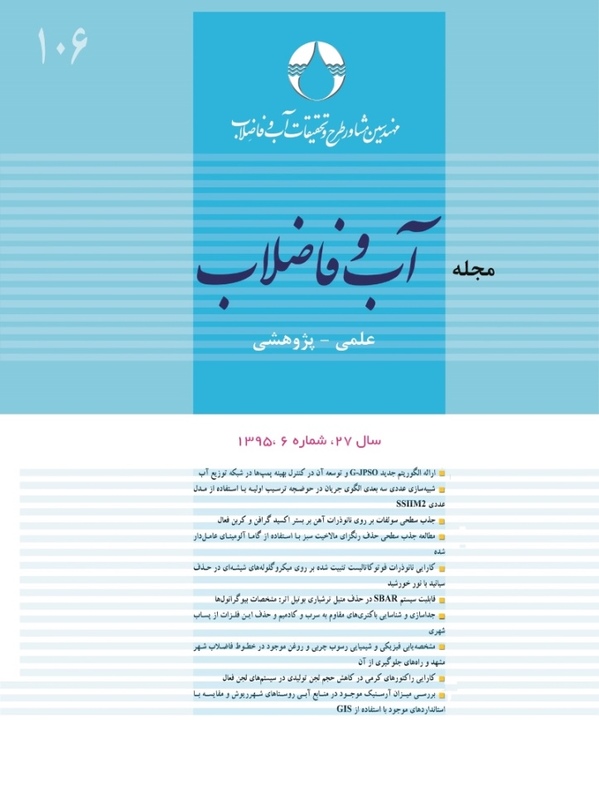 در این تحقیق سنتز اکسید گرافن توسط روش هامر انجام شد. در حین سنتز نانوذرات آهن، اکسید گرافن و کربن فعال به‌عنوان بستر به آن اضافه شد. اثر پارامترهای مختلف شامل مقدار گرم جاذب، pH و زمان تماس بر روی میزان جذب بررسی شد. همچنین مطالعات سینتیکی بر روی داده‌ها انجام شد. نتایج نشان داد که بیشترین درصد جذب توسط 06/0گرم جاذب در pH برابر 11 و بعد از 9 ساعت تماس محلول با جاذب برای نانوکامپوزیت آهن بر پایه اکسید گرافن و کربن فعال به‌ترتیب برابر با 84 درصد و 62 درصد بود. همچنین مشاهده شد که داده‌های آزمایشگاهی ظرفیت جذب بر حسب زمان متناسب با مدل سینتیکی شبه مرتبه دوم است. با ﺗﻮﺟﻪ ﺑﻪ نتایج ﺑﻪ‌دﺳﺖ آﻣﺪه، هر دو جاذب سنتز شده به‌عنوان جاذب‌های سازگار با محیط زیست، توانایی ﻣﻄﻠﻮﺑﯽ در حذف سولفات داشتند. This study is an experimental investigation of sulfate removal efficiency using iron nanocomposites on graphene oxide and activated carbon beds. The graphene oxide used was synthesized according to the Hummer method during which process graphene oxide and activated carbon were added. The effects of various parameters including adsorbent content, pH, and contact time on adsorption were investigated. Furthermore, the data were subjected to kinetic studies. Results revealed that the highest absorption rates of 84% and 62% were achieved for iron on the graphene oxide and activated carbon beds, respectively, when 0.06 g of the adsorbent was used at pH =11 over a contact time of 9 hours. It was also found that the kinetic pseudo-second-order model best fit the data. Finally, the results indicated that the two environmentally-friendly adsorbents have a good potential for removing sulfate from aqueous solutions. 1. Salman, M. S. (2009). “Removal of sulfate from wastewater by activated carbon.” Al-Khwarizmi Engineering Journal, 5(3), 72-76. 4. Nikoodel, M., Jamshidi, A., and Hafezi, N. (2012). “Evaluation of dissolution and deterioration of samples of building stones in a solution of sulfuric acid and nitric acid.” Earth Sciences, 20 (80), 135-142. 8. Blouin, G.M., Rindt, D.W., and Moore, O.E. (1971). “Sulfurcoated fertilizers for controlled release: Pilot plant production.” J. Agric Food Chem., 9, 801-808. 9. de-Bashan, L. E., and Bashan, Y. (2004). “Recent advances in removing phosphorus from wastewater and its future use as fertilizer (1997-2003).” Water Res., 38, 4222-4246. 10. Namasivayam, C., and Sangeetha, D. (2004). “Equilibrium and kinetic studies of adsorption of phosphate onto ZnCl2 activated coir pith carbon.” J. Colloid Interface Sci., 80, 359-365. 11. Kasama, T., Watanabe, Y., Yamada, H., and Murakami, T. (2004). “Sorption of phosphates on Al-pillared smectites and mica at acidic to neutral pH.” Appl. Clay Sci., 5, 167-177. 12. Tchobanoglous, G., Burton, F., and Stensel, D. (2003). Wastewater engineering , treatment and reuse, 4th Ed., McGraw-Hill, New York. 14. Halajnia, A., Oustan, S., Najaﬁ, N., Khataee, A.R., and Lakzian, A. (2013). “Adsorption–desorption characteristics of nitrate, phosphate and sulfate on Mg–Al layered double hydroxide.” Applied Clay Science, 80-81, 305-312. 15. Mengjuan, Y., Jianwei, L., Yanhui, Zh., and Honghua, Zh. (2014). “Adsorption of phosphate from water on lake sediments amended with zirconium-modiﬁed zeolites in batch mode.” Ecological Engineering, 71, 223-233. 16. Cao, A., Liu, Z., Chu, S., Wu, M., Ye, Z., Cai, Z., Chang, Y., Wang, S., Gong, Q., and Liu, Y., (2009). “Facile one-step method to produce graphene-CdS quantum dot nanocomposites as promising optoelectronic materials.” Adv. Mater., 21, 103-106.